A recent Gallup study indicates that 70% or more of the US working population is disengaged at work. That means they are merely showing up for a job to get a paycheck. They really don't care about their work. Why is it that so many people feel this way about their work? What can be done to change this feeling about our work? Employees can and should understand what success looks like for their job position and know clearly what is expected from their role within the company. The right people decisions lead to great execution. Follow the path below to create "A" Players in your organization. Jim Collins suggests that we ask first who, then what. If you hire A Players who are aligned with your Core Values & Purpose and who are excited and motivated by being on a team with other A Players, as opposed to hiring people who are committed to a specific strategy, it will be much easier to make adjustments to your strategy when necessary. And, as Collins points out, the best vision in the world without the right people to execute it will not get you very far. The right people will be aligned with your Core Values and passionate about your company and its work. In order to find these people you must first be clear about your company’s Core Values & Purpose. If you have not yet discovered what these are, click below for resources to help you with each. The most common definition of an A Player is “one who qualifies among the top 10% of talent available for a certain position.” We believe that A players will not only be able to consistently deliver good results but will also do it in a way that is aligned with your Core Values. Jack Welch developed the chart below during his time at GE to evaluate team members and determine A Players. Click here for a blog that outlines some specific strategies for increasing the number of A players on your team. Click here for a blog with strategies for working with underperforming team members (B players). Click here for a blog about when and how to deal with C players. 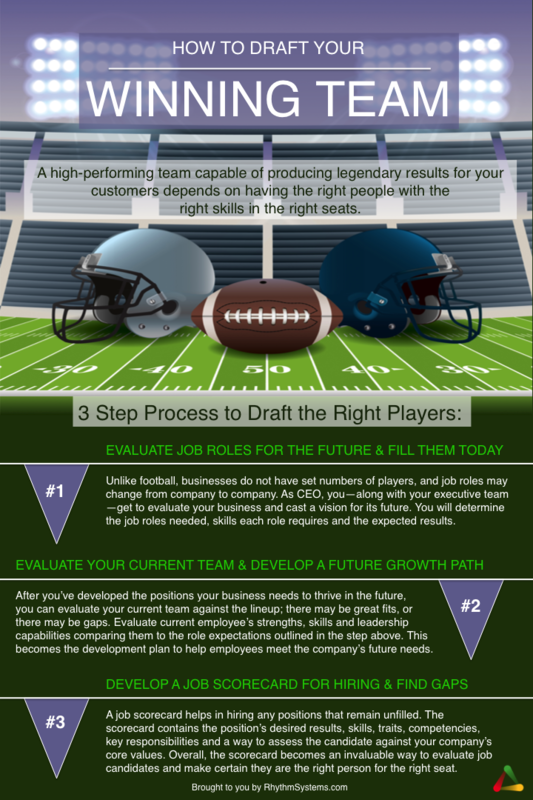 Topgrading is a method of recruiting, interviewing, selecting and retaining talent developed by Brad and Geoff Smart that is designed to increase your likelihood of hiring and retaining A players. Click here for a blog about Topgrading and the staggering cost of a mis-hire. Click here for a blog about how Topgrading can help with the top hiring problems companies face. Once you have your team of A Players, it is important to identify the key seats in your organization and make sure that accountability for specific company results is clear. What are the ultimate results expected for each function and how will you measure each? These are often very high level results found as line items on your P&L Statement and Balance Sheet. For each position, identify 1-2 KPIs you can track to ensure that this person is on track to achieve the ultimate results. Click here for information on KPIs. Unclear roles and unclear goals create stress, lack of accountability and poor performance in an organization. Each person deserves to know exactly what they are responsible for and how success will be measured. 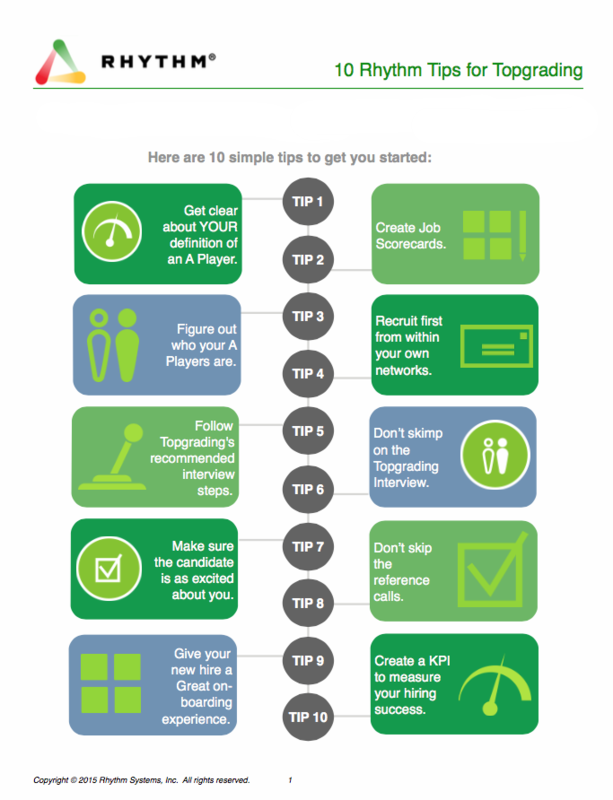 Completing Job Scorecards will help you clarify each role in your company. With role clarity, you'll be empowered to assess your own performance, own your results, identify personal development needs, and significantly multiply your contributions to the company and to your own success. Whether you are an executive team member, a department leader, or a member of the team, the role you play in the company is unique and important. You are there for a reason and you want to be successful. In order to be successful, you have to understand your purpose, what you are responsible for, how you will be measured, the skills you need to develop and the values you must uphold. Role clarity is key to your success. Completing your individual Job Scorecard requires collaboration between you, your leader, and your team. But, make no mistake - you own it. You may work on this as a company or as a department. If you are working on it on your own, you should work independently to create a first draft of your Job Scorecard. Then, review and refine the first drafts with your department leader. You will then continue to collaborate with your leader until you both are 100% aligned and agree on everything listed on your Job Scorecard. There is great value is this discussion, so please take full advantage of this opportunity to clarify and document realistic expectations. Your Job Scorecard is not complete until you and your leader are in 100% agreement. After that, you own it! You are accountable for your results, your personal development, and the successful completion of your responsibilities. Your leader’s role is to support you, remove roadblocks, and leverage the strengths of everyone on your team to achieve business results. Rhythm will help you track your progress and measure your success. 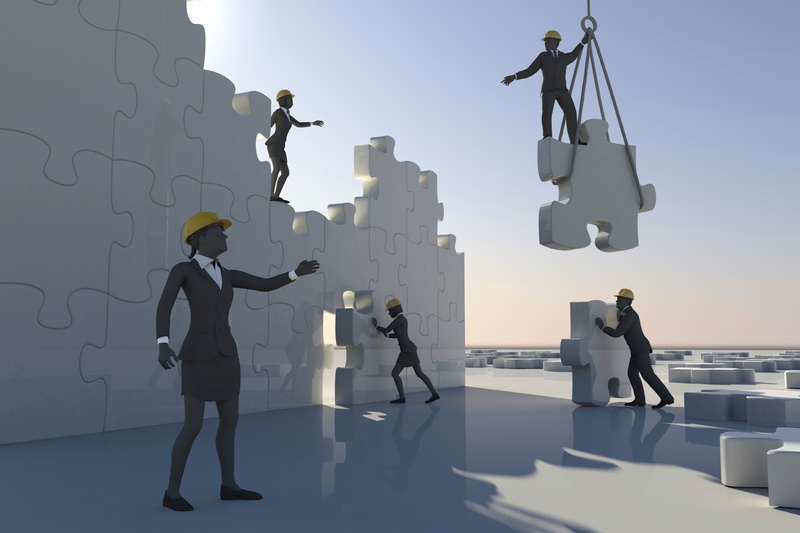 You will be able to know at all times if you are delivering great results and engage with your team to break through any roadblocks that come up. Job Position: What is your current role? Start with clarifying what your position is called. Reports To: Who do you report to in your role? For example, do you report directly to the CEO, or the head of a department? Purpose: Why does this job exist? Begin with the end in mind by starting with the overall purpose of this role within the organization. Understanding the purpose of the role will inform the way you think about the rest of the questions, and taking the time to think about and articulate the purpose of your role in the company will provide meaning to the work that you do and how you contribute to your organization’s Core Purpose. Desired Results & KPIs: What are you accountable for and how will success be measured? What is the visible and measurable evidence that the responsibilities are being met and the purpose is being fulfilled? This can sometimes be difficult to determine at first, but it’s easier once the Key Responsibilities have been determined. There are two parts to the Desired Results section. The first is a simple statement describing the desired result you are seeking. The second is identifying a KPI that will indicate whether or not this result is being achieved. For this, you can select from existing KPIs already set up in Rhythm or create a new one. Skills & Competencies: What is required in order to be successful? These are the specific skills, traits and competencies an individual must possess or develop in order to be successful in this role. It is important that you don’t just list things you are good at, but rather consider what you would need to look for in an individual that you would want to hire for this role. What is required to successfully fulfill the key responsibilities and achieve the desired results? No one knows better than you what is required to be successful in this role. Key Responsibilities: What do I do? These are the specific processes and activities that are owned by this role, and are necessary to fulfill its purpose and achieve the key results. This is not a long list of everything you do, but a statement of what you are responsible for accomplishing. One way to approach this is to make a list in a separate document of everything you currently do, then group the related items together in that list. This will help you organize and identify the key responsibilities of your role. 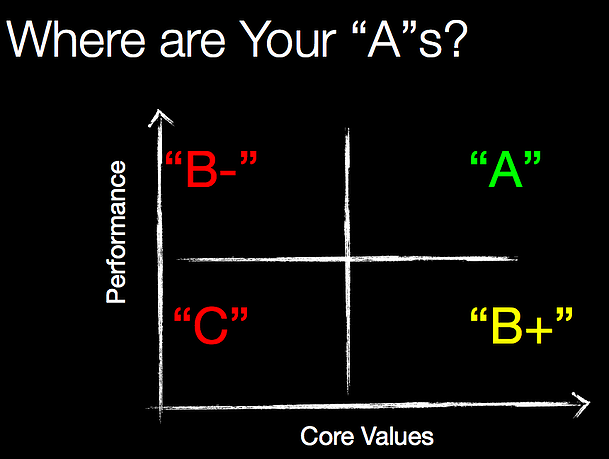 Company Core Values: What behaviors should be demonstrated? These are the Core Values for your company; this section will be pre-filled with information from your company’s strategy screens. They are fundamental beliefs that your company holds up and requires of everyone in the organization. They should describe your culture and drive your behavior. This is not about what you do, but how you do it. Take your People to the next level.